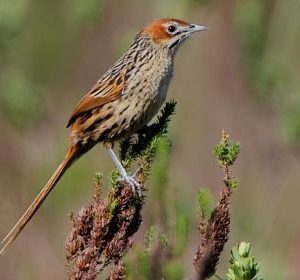 Has a long pointed straggly tail, chestnut cap and black malar and moustachial stripes. Rare visitor to Kingfisher Creek coastal thicket from fynbos area at the Heads. Call: Twittering musical notes ending in a single down slurred trill. Cat-like miaow alarm call. mainly insect-larvae, caterpillars, occasionally grass seeds. 17 to 19 cm Resident mainly insect-larvae, caterpillars, occasionally grass seeds.